I think it is the best place to stay in Rome! 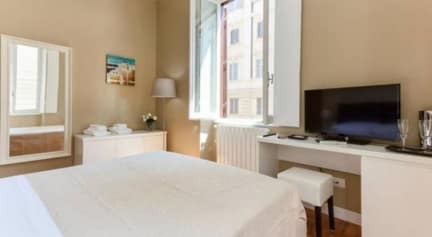 Really clean room, bathroom and kitchen, friendly and helpful staff, good wireless connection also nice breakfast and good location. Hotel is about 15 min to Termini station. This hotel desevres 10/10. This place is great! Great price, super clean, and well appointed! Good breakfast, hot water, AC, window out onto the street. The location was near the villa borghese, so a bit far from the Vatican, but I walked everywhere else. I suppose it is a bit loud with the windows open, but I just closed them and turned on the AC at night. Thanks for a great stay!!! We enjoyed staying at this hostel during our time in Rome, it was very clean and they offered breakfast and snacks. Unfortunately we were not greeted by anyone from the hostel throughout our stay, this made it challenging to checkin on our arrival. Otherwise, everything else was smooth. Keep in mind there is no close access to the metro (approx 30 min walk to nearest metro), but there are buses that pass by 2 min away from hostel that will take you to the city centre and metro.